2. A structured program to lay a strong foundation in his/her formative years for developing into a responsible, happy and fulfilled adult. Our nurturing environment and structured academic program assist your child to develop into a healthy, mentally and psychologically fulfilled, extremely well-educated adult brimming over with joy and kindness towards others. To achieve these goals the staff at Little Friends Montessori school works enthusiastically to promote physical, social, emotional and intellectual development of your child. More and more people recognize the importance of first six years of life in developing a strong foundation (discipline, structure, responsibility and love for learning) for the future. During these early years the staff at Little Friends Montessori school work with children and parents to ensure that each child builds a strong foundation for the future. 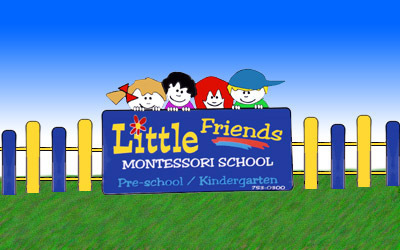 Little Friends Montessori school is dedicated in preparing your child for a lifetime of learning.